There are more than 100 Catholic elementary schools serving the most under-resourced neighborhoods in the Los Angeles area. Despite the importance of athletics to the overall health and well-being of their students, these schools often lack the funds to pay for qualified coaches, equipment, uniforms and the league fees needed to offer quality team sports programs. The result: according to the Aspen Institute, kids from lower income families tend to play team sports at half the rate of their wealthier peers. Sadly, money is the biggest driver of sports participation by children. 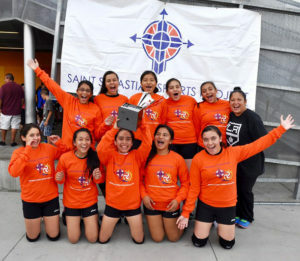 Since 2009, the Saint Sebastian Sports Project (SSSP) has provided resources critical to building quality team sports programs in the most underserved elementary schools in the LA archdiocese. Beginning with a handful of schools in our initial year, the Saint Sebastian Sports Project now disburses more than $100,000 annually to help supply equipment, uniforms and coaching stipends to 50 Catholic schools in the Los Angeles Archdiocese. That’s not all we do. We also hold clinics to enhance coaching skills, and put on tournaments for those teams that would ordinarily never qualify for post-season play. 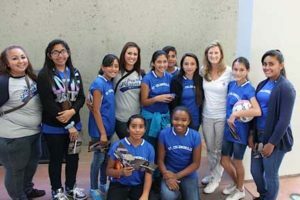 To expose students to college opportunities, we have partnered with Loyola Marymount University (LMU) to sponsor fun-packed sports days in which kids receive a personalized tour of the campus, watch some inter-collegiate play, and enjoy a meet-and–greet with some of LMU’s Division I athletes. In 2017, in conjunction with Loyola High School basketball coach Jamal Adams, we hosted our first annual “Leadership Academy” to help prepare outstanding eighth-grade scholar-athletes for the transition to high school. While funding capital improvement projects is not in our core mission, we are keen to take advantage of opportunities when they arise. For example, in 2014, in partnership with J.F. Shea & Co. we were able to remodel the gymnasium at St. Albert the Great school in Compton. The re-named Lew Yocum Memorial Gymnasium is home to our annual Christmas Classic Basketball tournament and also provides much needed gym space for the league basketball and volleyball games of some twenty neighboring inner-city Catholic schools. Over the past nine years, thanks to the support of our generous donors, thousands of Catholic school students across Los Angeles have had the chance to play on their schools’ sports teams. The opportunity has paid dividends; 91% of SSSP schools report that these student/athletes have higher attendance rates, and 75% of the athletes have demonstrated higher academic achievement than their non-participating peers. The SSSP students clearly appreciate the fun and recognize the benefits that accrue from being a member of a sports team. Among the 2017 class of eighth grade graduates from SSSP schools, 249 girls and 274 boys plan to play a high school sport. We know we are changing lives, one game at a time. You are on the web site for Saint Sebastian Sports Project of Los Angeles. Click here for Saint Sebastian Sports Project of Denver. 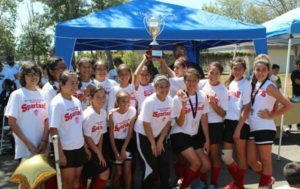 The Archdiocese of Los Angeles recognizes Saint Sebastian Sports Project’s 10 years of accomplishments in it’s Angelus Newsletter. Saint Sebastian Sports Project was reviewed by the Beach Reporter. 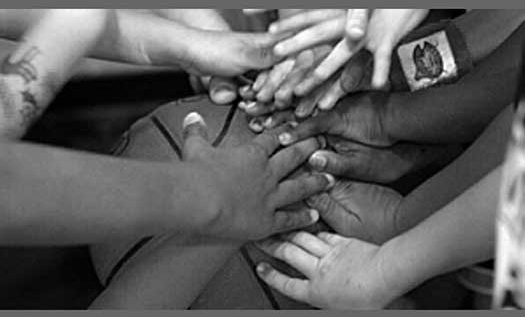 Also read about Saint Sebastian Sports Project on Charity Matters.